During the energy crisis of the 1970s, a prevailing belief took root where it was thought that tightly sealing walls and ceilings with a vapor barrier was essential to blocking heat transference and reducing energy costs. It was soon determined, however, that unless the seal was absolute, moisture that did get into sealed walls could create serious structural problems and health issues, such as allergic reactions to mold festering within walls. Although it is still good practice to minimize heat loss through walls, ceilings, and floors, it is now known that it is equally important for the vapor barriers to be installed correctly and that walls also are able to "breathe." Some debate still occurs over how necessary vapor barriers are, but a consensus is growing closer. Most authorities now agree that vapor barriers are important under certain conditions, but not necessarily as a whole-house solution for every home. In circumstances where conditions inside a home or office are much different than outdoor conditions, water vapor is likely to move through wall cavities and can get trapped inside, and a well-installed vapor barrier is recommended. Vapor barriers can also be important for certain rooms where moisture levels are especially high. Water vapor can pass through building materials in several ways, including direct transmission, and by heat transfer, but studies suggest that fully 98 percent of the moisture transfer through walls occurs through air gaps, including cracks around electrical fixtures and outlets, and gaps along baseboards. Thus, installing vapor barriers on wall surfaces must be done in conjunction with sealing these air flow-gaps in walls and ceilings, and along floor surfaces. Once thought to be essential throughout a home or office, vapor barriers are now strongly recommended only for certain conditions, and methods for creating a vapor barrier must be tailored to fit the climate, region, and type of wall construction. For example, the recommended vapor barrier in a home or office in a humid southern climate built with brick varies greatly from creating a vapor barrier in a cold climate in a home built with wood siding. Always refer to current local code recommendations when deciding if and how to install vapor barriers. Avoid adding interior vapor barriers where the outer wall construction already includes a material with vapor barrier properties. 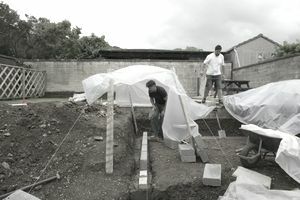 In areas with high humidity—such as greenhouses, rooms with spas or swimming pools, and bathrooms—vapor barriers are often recommended. Consult building inspection offices for local recommendations. In very cold climates, the use of polyethylene plastic vapor barriers between insulation and interior wallboard may be beneficial, provided all air gaps into any wall and ceiling cavities are also blocked. The exterior face of the wall or floor cavity should remain permeable in order to allow dissipation of any moisture that does enter the wall cavity. Very hot and humid climates may benefit from an exterior vapor barrier that keeps outside humidity from penetrating into walls. Below-grade walls and floor slabs transmit ground moisture through concrete walls or slabs. A vapor barrier against the concrete surface is generally recommended before wood framing or flooring materials are installed. Crawl spaces benefit from a polyethylene moisture barrier placed directly over the exposed earth. Vapor barriers are usually best installed on the side of the wall that experiences the hotter temperature and moister conditions: the inner surface in colder climates and the outer surface in hot, humid climates. In existing spaces, oil-based paints or vapor-barrier latex paints offer an effective moisture barrier. Avoid fully impermeable barriers, such as polyethylene or vinyl wall coverings, on spaces that are air-conditioned. This practice has been linked to moldy buildings and other air quality problems. Avoid installing vapor barriers on both sides of a structure. Walls and ceiling cavities should ideally have the ability to dry out in one direction if the other side is constructed to prevent moisture penetration. Seal all wall cracks and holes in the wall being vapor-proofed to block air gaps. Use special sealing tape to join sheets if polyethylene sheets are being used. Complete air blockage is essential to provide a satisfactory moisture barrier, and will also maximize the wall's energy efficiency. Use acoustic spray-foam sealant or sealant tape to block spaces around electrical boxes at outlets, switches, or ceiling light fixtures. To assist builders in controlling moisture, various building materials are rated according to permeability and are assigned a perms rating. A variety of rating systems are in use, but one common one is the U.S. permeability system. Impermeable materials are not always desirable, as in some situations a wall needs permeable materials in order to properly breathe and rid itself of excess moisture. Most experts advise against sealing a wall on both sides, as this is a prescription for trapping moisture and fostering the inherent problems it creates.